When you arrive at St. John’s Parish Center you will be greeted by our race volunteers who will verify your registration, issue you a race bib along with safety pins to secure on your clothing, your T-shirt, and goody bag. That’s it! You are done until the race starts! Use that time to talk with other racers, stretch, or simply just relax before the race. We will be taking registrations at the St. John’s Parish Center starting at 7:00 AM on race day until 8:00 AM. 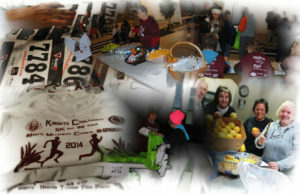 After paying your registration fee, you’ll be given your race bib, T-shirt, and goody bags as well. 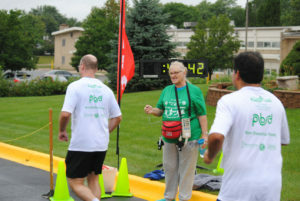 Then you too can meet other racers, stretch, or simply relax before the race starting time. Restroom facilities are present onsite. In addition there is a selection of healthy snacks (fruit, nuts, granola bars, and water) available before and after the races (thanks to our generous sponsors). The race starting point is just out front of the parish center. About 5-10 minutes before the race start time, we’ll announce for everyone to gather outside to get lined up. The Village of Streamwood will have police personnel on hand to block traffic. The horn will sound, and away the racers / walkers go. See the course map for more details. There will be spotters and water along the 5K race course which is also marked by signs. There is a follow car and ambulance on hand to make sure everything goes smoothly and any emergencies are handled. The race begins and ends at St. John’s Church. As you enter the church parking lot, you’ll race through the cones for the length of the lot and then turn slightly left to the finish line. Be sure to keep running / walking past the timer (through the marked lane). There will be several volunteers there to help slow you down and retrieve your race bib (timing is all done electronically). Head inside the parish center for some refreshments, to unwind, talk with race sponsors, and your fellow contestants. Once everyone has crossed the finish line, we’ll start the Kids Fun Dash (we anticipate this will be approximately 9:30 AM). While the dash is run, we’ll get the final tally from the race timers, and then pass out awards. If you are unable to stay for the awards, just let one of the volunteers know and arrangements can be made to get your prizes to you at a later date. If we haven’t answered all your questions, please use the Contact form and we’ll be happy to provide you with additional details.